Great News! The Entire Silvan Selecta Spring Calalogue is now available online at The Farm Co! Download it now and get familiar with your new best friend! This fantastic catalogue, is packed with red hot specials, and many new exciting releases from accross the full range of Selecta products. Additionally, every product in the catalogue is linked directly to our website - making it EASIER THAN EVER for you to buy! 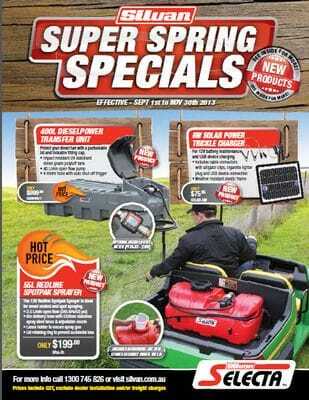 Don't miss out - specials are valid until November 30th 2013 - download your catalogue copy NOW! For all sales advice, product queries and general information please give us a call on 1300 327 626.